Each season I work hard to make sure my closet has the basic elements to create a lifestyle wardrobe – outfits that work for basically any event. It takes about 21 items to get me all set for work, church, errands or days at home. 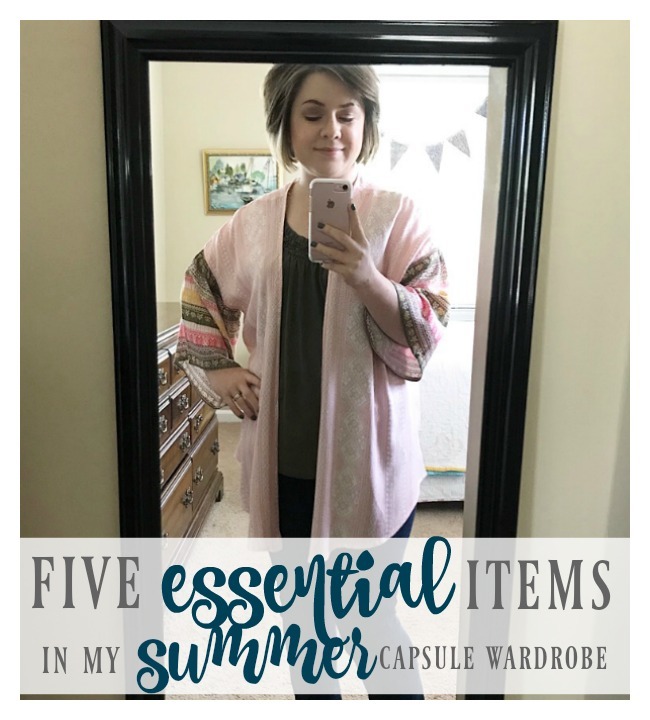 I have a quick video that will show you 5 essential pieces in this summer’s wardrobe. Here they are! Courtney Metz often shares great deals for these on Instagram! I also love graphic tees from Cents of Style! 4. Printed Kimono: petite style! What are your summer outfit essentials? My summer wardrobe includes a ton of cropped pants and fun tops. I also have a few pairs of sandals that go with most everything. Something I can throw on and stay cool in is so important. The trick to the kimono is finding one that works for your body type. Mine is slightly fitted and is shorter in the back – that really helps! Fitted really helps with a lot of sweaters I’ve found. Otherwise, I feel like I’m in a sleeping bag! Haha! I just read your mom’s blog post. There you two go again. Which one is the copycat? Hahahaha! Welcome to the kimono club!! Aren’t they fun!?! I have several and love that them. Also, love those shoes. I’ll have to keep an eye out for something like that. Wish I could wear things from the girl’s section because you always recommend the cutest stuff. I have one of those Old Navy swing dresses and feel like I could wear it every day! It’s so comfy and versatile, yet classier than just shorts and a t-shirt. I’m thinking I need to pick up one (or, you know, 3) more! I agree – those dresses are so versatile! Love your summer choices! I definitely need to check out the girls kimonos. I am 5’3” and the ladies are just overwhelming on me. I also think I am the only person who doesn’t wear the hi-low top well. I’m just not grasping the trend! I do love your lemons for a fun top. Thanks for sharing! There aren’t tons of options with girl’s kimonos, but the one I found online at Target is perfect. Hope you can find one!